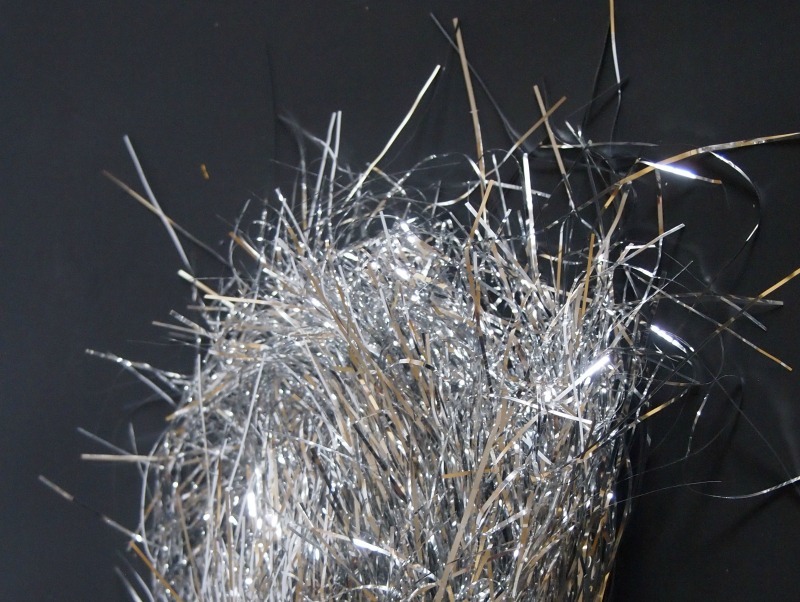 Tinsel is a Holiday staple, don’t you think? 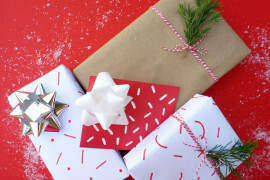 It pretty much screams Christmas, whether it’s draped over a tree in that kitschy, awesome 1980’s kind of way or you’ve stuffed them in a box to surprise a loved one when they open up a gift on Christmas morning, tinsel is amazing! 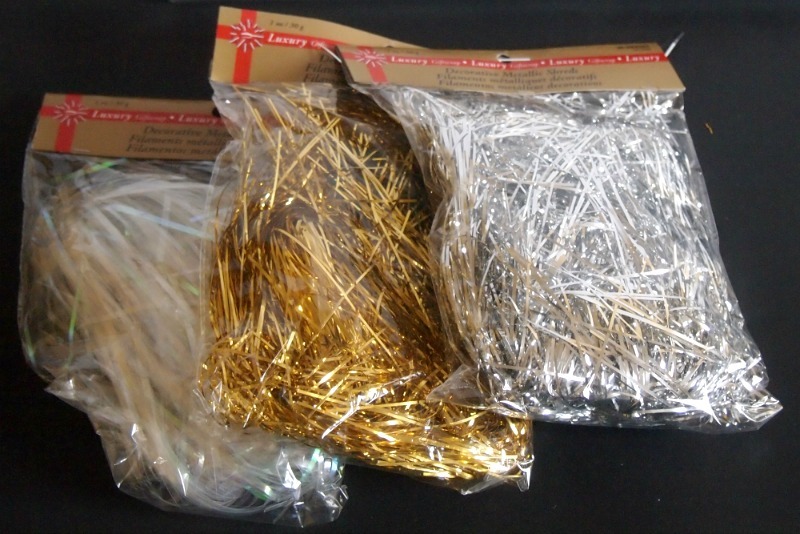 Now, have you ever tried to use tinsel for anything other than those last two options? I hadn’t either until now! 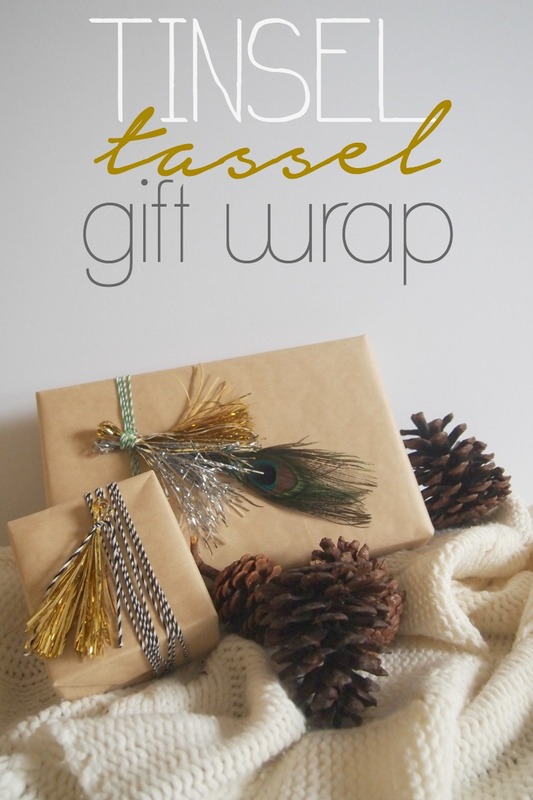 I have a big love for tassels, and when I saw tinsel on the shelves of Target this year, I instantly imagined them becoming tassels – doesn’t everybody imagine DIY crafts when they’re out shopping for paper towels? 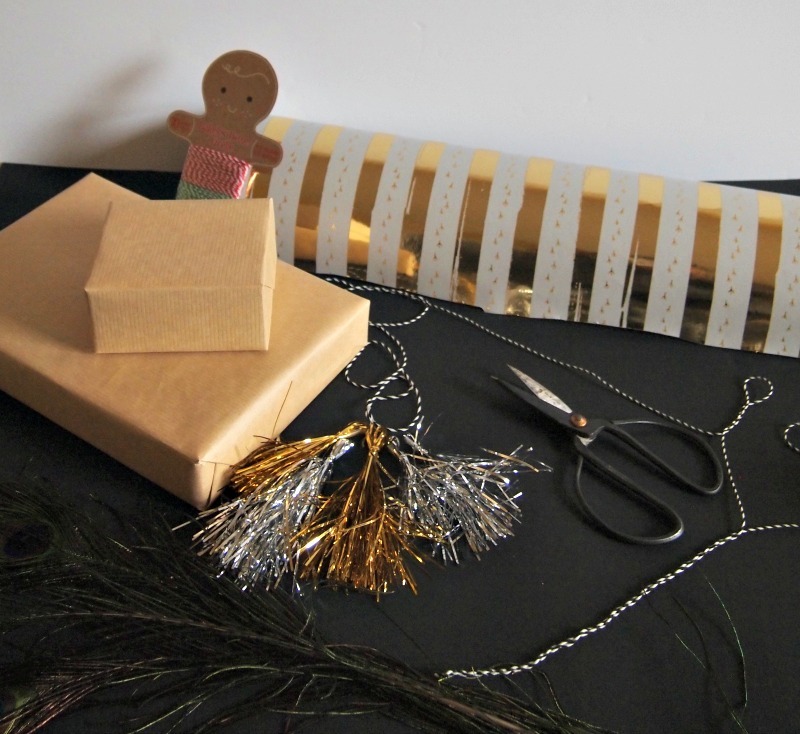 Anyway, it turns out you can make tinsel tassels! YAY! Materials? Well that’s simple – whatever colour of tinsel your little heart desires! 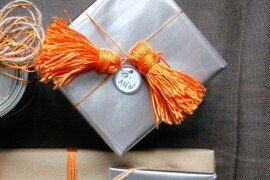 You might also like to have some scissors around and some twine, or ribbon. 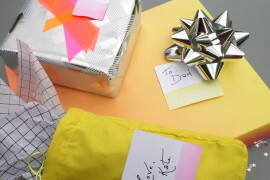 Oh, and don’t forget the presents to put these on! 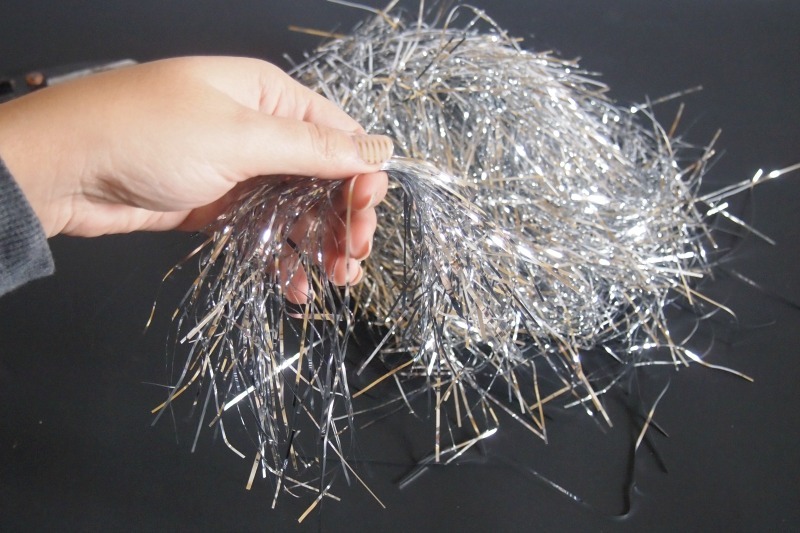 When you take the tinsel out, it’s kind of a big mess!, but it’s also a whole lot of fun! At this point, you pretty much just need to grab a few strips and try to line them up as best as you can, but don’t worry about being perfect or you’ll drive yourself insane! Keep going until you think you have enough for your tassel. There’s no right or wrong here, so just do your thing and go with your gut. Now add a small strip of tape to keep these little guys together because tinsel is slippery and it will start to all come apart on you. Clear tape is your friend here! 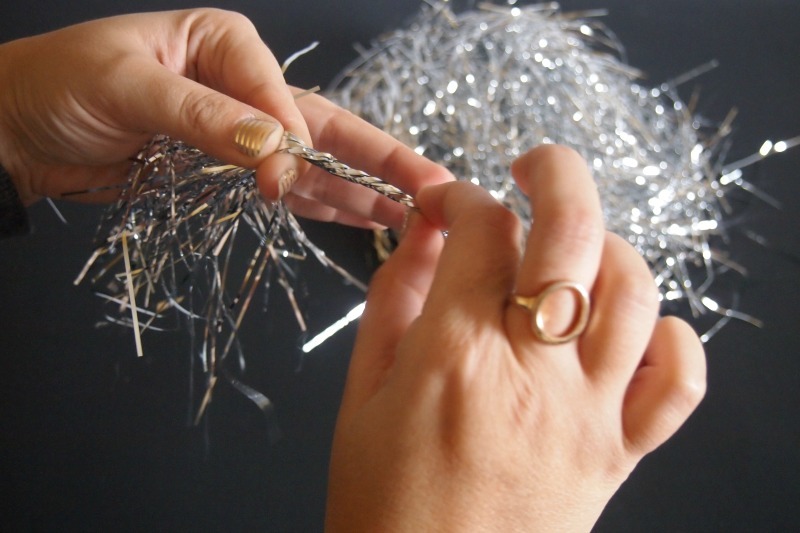 Then, “fold” your strips is half and tie a piece of tinsel around the top of the loop to complete your tassel. Now you have a crazy looking tassel, and you could be done because it does look kind of cute this way! However, I decided I needed things to be a little neater for me so I cut the bottom in a straight line. 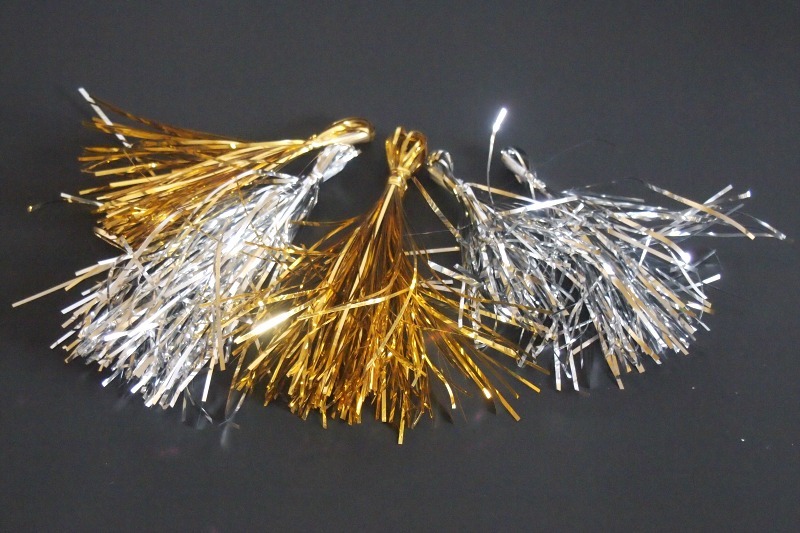 Keep going with all of the other tinsel and go on to try it out with new colours, too! 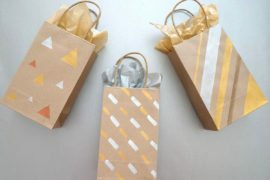 Now you’re ready for using your awesome new tassels. 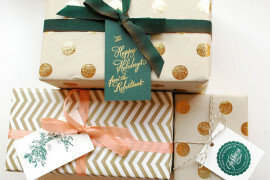 Grab some gifts, ribbon, baker’s twine, wrapping paper, tape, and whatever else you’d like to add to your gift wrap. I chose a peacock feather as an accessory! 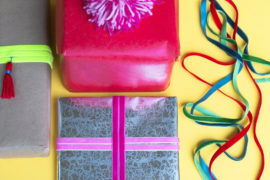 Now get creative and start putting everything together. 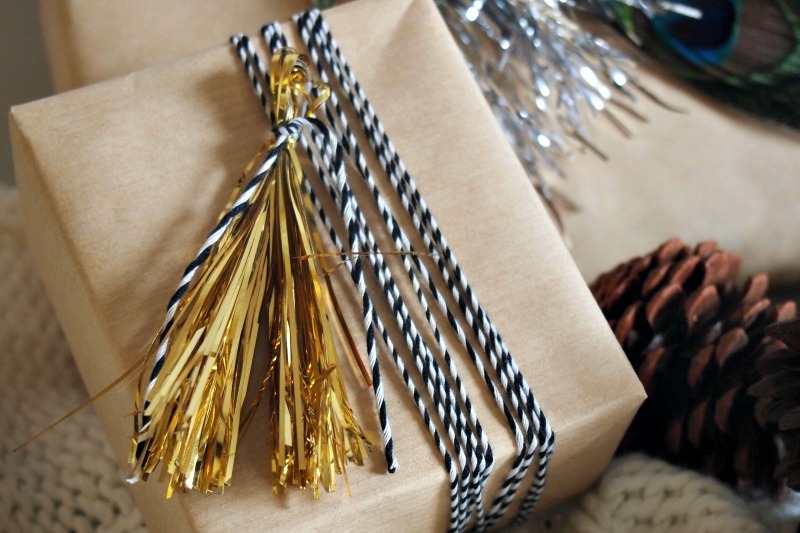 For a small gift, I used just one tassel and black and white baker’s twine. For the larger present, I added the peacock father, green and white baker’s twine, and combined two tassels. And you’re all done! 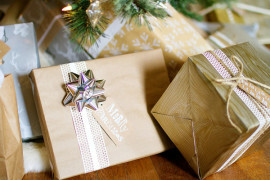 Now go on and place these presents under the tree. 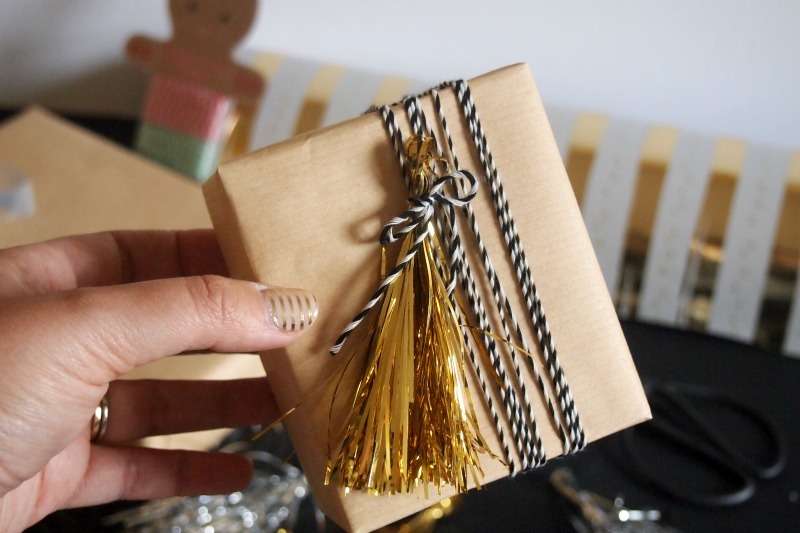 I’m sure this tinsel would pick up on the lights so well, and the sparkle would be lovely! 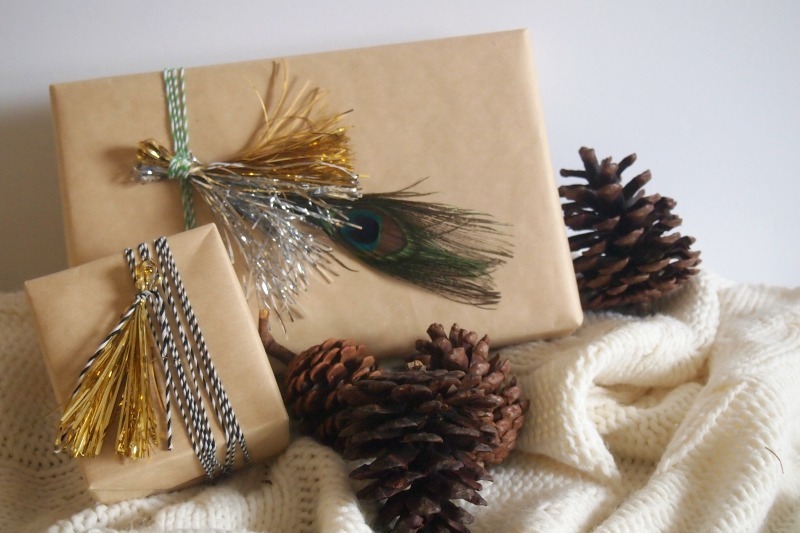 I happen to like the mix of sparkly tassels, dull paper, rustic pine cones, and soft wool! 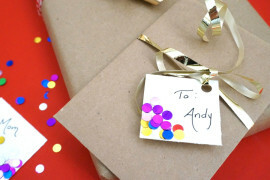 Here’s a little close-up of the smaller present. I ended up switching the bow to a simple knot because sometimes less is more, am I right? So what do you say? 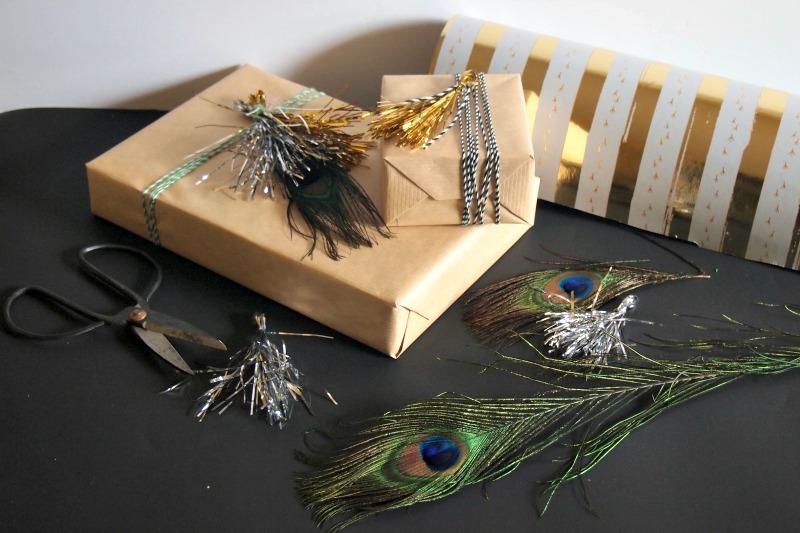 Will you give tinsel a shot this year for wrapping your gifts? 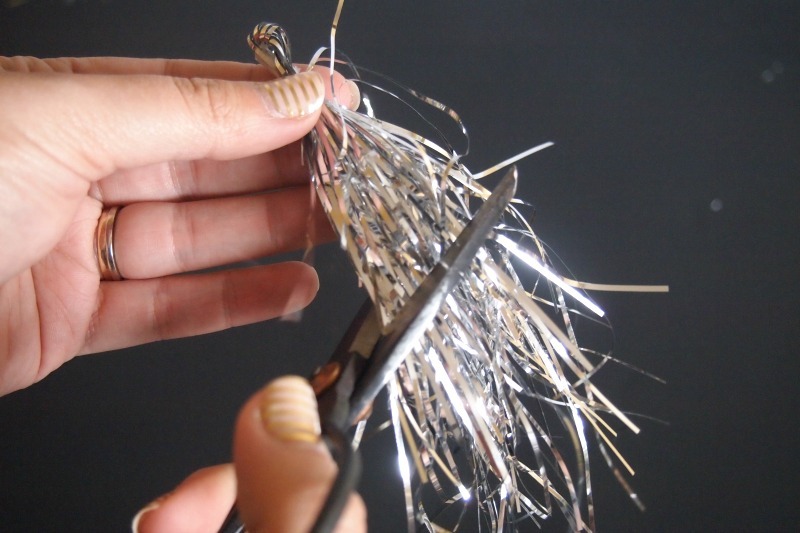 Will you dare go into that crazy bag of teeny tiny strips of shiny and make something streamlined with it? I think you should!